On February 7th 1904 the city of Baltimore Maryland was stricken by a CONFLAGRATION that started in a storage area / basement of the 6 story Hurst building. The fire burned 155 acres of mercantile property valued at 55 million and 50,000 people lost jobs. Multiple other cities showed up with equipment some even shipped by train. What was the wrench in the system that prevented all these departments from working together? You guessed it! They could not thread their hose together to supply their apparatus. See the list below. After 103 years we still have the same problem in certain areas. Just as pharmacists have the mortar and pestle and doctors have the caduceus, Emergency Medical Technicians have a symbol, its use is encouraged both by the American Medical Association and the Advisory Council within the Department of Health, Education and Welfare. The symbol applies to all emergency medical goods and services which are funded under the DOT/EMS program. Designed by Leo R. Schwartz, Chief of the EMS Branch, National Highway Traffic Safety Administration (NHTSA), the "Star of Life" was created after the American National Red Cross complained in 1973 that they objected to the common use of an Omaha orange cross on a square background of reflectorized white which clearly imitated the Red Cross symbol. NHTSA investigated and felt the complaint was justified. The newly designed, six barred cross, was adapted from the Medical Identification Symbol of the American Medical Association and was registered as a certification mark on February 1, 1977 with the Commissioner of Patents and Trade-marks in the name of the National Highway Traffic Safety and Administration. The trademark will remain in effect for twenty years from this date. The capitol letter "R" enclosed in the circle on the right represents the fact that the symbol is a "registered" certification. The snake and staff in the center of the symbol portray the staff Asclepius who, according to Greek mythology, was the son of Apollo (god of light, truth and prophecy). Supposedly Asclepius learned the art of healing from the centaur Cheron; but Zeus - king of the gods, was fearful that because of Asclepius knowledge, all men might be rendered immortal. Rather than have this occur, Zeus slew Asclepius with a thunderbolt. Later, Asclepius was worshipped as a god and people slept in his temples, as it was rumored that he effected cures of prescribed remedies to the sick during their dreams. Asclepius was usually shown in a standing position, dressed in a long cloak, holding a staff with a serpent coiled around it. The staff has since come to represent medicine's only symbol. In the Caduceus, used by physicians and the Military Medical Corp., the staff is winged and has two serpents intertwined. Even though this does not hold any medical relevance in origin, it represents the magic wand of the Greek deity, Hermes, messenger of the gods. The Bible, in Numbers 21:9, makes reference to a serpent on a staff: "And Moses made a bronze serpent and set it on the standard; and it came about, that if a serpent bit any man, when he looked to the bronze serpent, he lived. Who may use the "Star of Life" symbol? NHTSA has exclusive rights to monitor its use throughout the United States. Its use on emergency medical vehicles certifies that such vehicles meet the U.S. Department of Transportation standards and certify that the emergency medical care personnel who use it have been trained to meet these standards. Its use on road maps and highway signs indicates the location or access to qualified emergency care services. 1. As a means of identification for medical equipment and supplies for installation and use in the Emergency Medical Care Vehicle-Ambulance. 2. To point to the location of qualified medical care services and access to such facilities. 3. For use on shoulder patches worn only by personnel who have satisfactorily completed DOT training courses or approved equivalents, and for persons who by title and function administer, directly supervise, or participate in all or part of National, State, or community EMS programs. 4. On EMS personnel items - badges, plaques, buckles, etc. 5. Books, pamphlets, manuals, reports or other printed material having direct EMS application. a) Administrative and dispatcher personnel must use a silver colored edge, and the staff of Asclepius should be with a silver colored serpent. These items do not need a white background. b) The shoulder patches and other EMS patches may be displayed on uniform pockets and the symbol can also be placed on collars and headgear. This article was taken from Rescue-EMS Magazine, July-August 1992 "THE STAR OF LIFE"
Each of the six "points" of the star represents an aspect of the EMS System. The staff on the star represents Medicine and Healing. The Maltese cross is known around the world as a symbol of the fire service. It is often seen painted on fire trucks, on the clothing of firefighters, depicted on firefighters badges, and is quite often the chosen design of firefighter tattoos. So where did the Maltese cross come from, and how did it get to be known as a symbol of the fire service? The Badge of a Fire Fighter is the Maltese Cross. The Maltese Cross is a symbol of protection and a badge of honor. Its story is hundreds of years old. When a courageous band of crusaders known as Knights of St. John fought the Saracens for possessi on of the holy land, they encountered a new weapon unknown to European warriors. It was a simple, but horrible device of war. It wrought excruciating pain and agonizing death upon the brave fighters for the cross. The Saracens weapon was fire. As the crusaders advanced on the walls of the city, they were struck by glass bombs containing naphtha. When they became saturated with the highly flammable liquid, the Saracens hurled a flaming torch into their midst. Hundreds of the knights were burned alive; others risked their lives to save their brothers-in-arms from dying painful, fiery deaths. Thus, these men became our first Fire Fighters and the first of a long list of courageous Fire Fighters. Their heroic efforts were recognized by fellow crusaders who awarded each hero a badge of honor-a cross similar to the one fire fighters wear today. Since the Knights of St. John lived for close to four centuries on a little island in the Mediterranean Sea named Malta, the cross came to be known as the Maltese Cross.The Maltese Cross is your symbol of protection. It means that the Fire Fighter who wears this cross is willing to lay down his life for you just as the crusaders sacrificed their lives for their fellow man so many years ago. The Maltese Cross is a Fire Fighter's badge of honor, signifying that he works in courage...a ladder rung away from death. Rome was very impressed by this young Captain and all that he had accomplished. They decided to reward him by making him a general. Generals were often given large tracks of conquered land to govern. The only rules were that they had to enforce the laws of Rome and collect the taxes. Florian's area included almost all of Poland. Rome began to hear some rumors about the way Florian was governing his land. It was reported that he was not enforcing Rome's law forbidding Christianity. Rome did not believe this, but they did sent investigators to check. They reported back that it was true. Rome sent a group of soldiers to confront Florian. They warned and threatened him that he must enforce the laws of Rome and abolish Christianity. Florian not only refused he confessed that he had embraced the faith and become a Christian himself. Rome was furious. They tortured him and demanded he renounce his faith. Florian steadfastly refused. Rome ordered his execution. After his death, people who were trapped by fire reported that they invoked Florian’s name and his spirit delivered them from the flames. These occurrences were reported and documented many times. 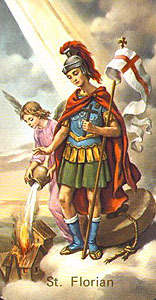 Florian was confirmed a saint for his commitment to his faith and the documentation of his spirit delivering trapped persons from the flames. It is only fitting, that firefighters, committed to their duty, and instilled with thespirit to dedicate themselves to the protection of life and property, shouldchoose such a man as their patron saint. Today the Dalmatian serves as a fire house mascot, but back in the days of horse drawn fire carts, they provided a valuable service. Dalmatians and horses are very compatible, so the dogs were easily trained to run in front of the engines to help clear a path and guide the horses and the firefighters to the fires quickly. They are still chosen by many fire fighters as pets in honor of their heroism in the past. Dalmatians have been used throughout history for serious work. They have been sentinels on the borders of their homeland of Dalmatia and Croatia during wars. They worked as shepherds, as draft dogs, as hound dogs, as hunting dogs, as retrievers and as preforming dogs. Dalmatians are not only intelligent, but they also have excellent memories. Their speed, endurance and lack of a fear for horses, enabled them to become superb coach dogs for the horses and the engines. Dalmatians first known as "coach dogs" were first used in the 17th, 18th and 19th. century in England, Scottland and Wales. Wealthy aristocrats sought out the unusal looking spotted dog for use with their coaches. They are very physical and strong and muscular and able to run long distances. They would run along side the coach or just behind the rear of the horses. These eye catching canines lent an air of superiority to the coaches of the wealthy as they traveled through the vilages. The dogs were an important part of any stable that housed teams of pulling horses. A stable dog has a calming effect on the horses and makes them feel comfortable in their stalls. Many of the dogs were said to have litter right in the same stalls as the horses. Horses are gregarious and feel the need for company. The dalmatians served this purpose. They would run along side the horses or under the axle of the coach and keep up with the team for as much as 20 - 30 miles per day. They would also help to clear the way for the team and keep other dogs from interfering with the horses. Also, horse theft was so common back then that coach and stage coach drivers used the dogs as guards to protect the team and the luggage in the coach. The dogs were first used in the fire service when most fire companies were volunteer or privately operated. There was some competition for services. Some of the firefighters were actually recruited not only for their strength in fighting fire but for their fighting abilities to protect the company and its equipment. Insurance compaines paid the fire company that put out the fire, so the one that made it to the scene, hooked up to a hydrant and completed the task, got paid. The dogs worked well at this task of protecting not only the horses, but the equipment in the stations and on the fire ground as well. Early firefighters took tremendous pride in their compaines. They would turn out and parade through the city at almost any occcasion. Polished brass and brillant paint scemes and the gleaming leather were always maintained. Just as the dalmatians worked with private coaches, they worked fire comanies. When dalmatians appeared with the engines, peolpe gawked just as they did with the coahes in England. The end of the era for Dalmations as a coaching dogs for fire departments became about the advent and introduction of motorized cars and fire engines. However, they are still on duty in many fire stations today acting as companions to the firefighters and as watch dogs protection the equipment! The tradition of bagpipes played at fire department and police department funerals in the United States goes back over one hundred fifty years. When the Irish and Scottish immigrated to this country, they brought many of their traditions with them. One of these was the bagpipe, often played at Celtic weddings, funerals and ceilis (dances). It wasn't until the great potato famine and massive Irish immigration to the East Coast of the United States that the tradition of the pipes really took hold in the fire department. In the 1800's, Irish immigrants faced massive discrimination. Factories and shops had signs reading "NINA" - No Irish Need Apply. The only jobs they could get were the ones no one else wanted - jobs that were dirty, dangerous, or both - firefighters and police officers. It was not an uncommon event to have several firefighters killed at a working fire. The Irish firefighters' funerals were typical of all Irish funerals - the pipes were played. It was somehow okay for a hardened firefighter to cry at the sound of pipes when his dignity would not let him weep for a fallen comrade. Associated with cities such as Boston, New York, Philadelphia, and Chicago, pipe bands representing both fire and police often have more than 60 uniformed playing members. They are also traditionally known as Emerald Societies after Ireland - the Emerald Isle. Many bands wear traditional Scottish dress while others wear the simpler Irish uniform. All members wear the kilt and tunic, whether it is a Scottish clan tartan or Irish single color kilt.